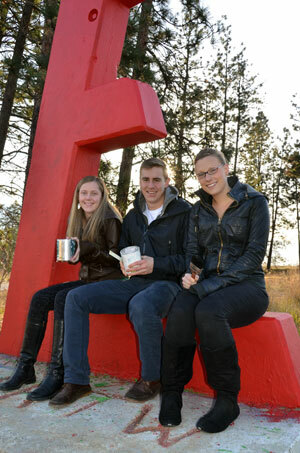 Engineering students Tia Haunts, Will Patterson, and Heather Mallory are ready to paint the iconic red E white, so participants in the memorial service next week can then write messages of hope and inspiration onto the E.
As a result of the crime, Canada established December 6 as the National Day of Remembrance and Action on Violence Against Women. At UBC’s Okanagan campus, November 25 to December 6 are set aside for the annual White Ribbon Campaign. It’s a time to remember the women killed, commemorate the tragedy, and create awareness about the Eradication of Violence Against Women campaign, says Women in Engineering committee member Tia Haunts. UBC’s Women in Engineering committee has organized a number of events including a free showing of the movie Polytechnique, the 2009 Genie Award-winning film directed by Denis Villeneuve. The fact-based film recreates the lives of the engineering students, as well as the atrocities committed by Lépine. The screening of Polytechnique (produced in French with English subtitles) is Monday, November 25 at 5 p.m. in the Student Union Theatre, UNC Building, and is free and open to the public. Throughout that week, there are a number of awareness events and displays at various locations across campus. A memorial service for the victims of the December 6 tragedy will be held in the Engineering, Management and Education Building’s Richard S. Hallisey Atrium at 11 a.m. on Wednesday, November 27. Following the service, everyone is encouraged to participate in the painting of the Engineering concrete ‘E’ icon outside the EME building. Commemorative messages of inspiration, peace, and hope will be painted onto the large E, which will be painted white for the White Ribbon campaign. The E is normally painted red. Fourth-year civil engineering student Will Patterson says this is not an issue that concerns only women. Patterson is speaking at the memorial service and wants underline how violence against women is an issue that deeply impacts men and women. "It's important that we as men and women remember and talk about this tragedy to help break the outdated norm of silence, and thereby consenting to the oppression of women,” Patterson says. “The dialogue stimulated through the White Ribbon Campaign raises awareness about gender inequality and provides a platform that encourages men to take ownership of the shift to an equal and violence-free culture."